Solar power has never been more affordable, thanks to technological advances and generous government rebates and tax credits. If you are a homeowner or commercial energy consumer, Solar Bethesda is a free, one-day event where you can have your questions answered by solar experts. Learn about solar costs, benefits, rebates and tax credits; hear from neig hbors about their experience with solar power or solar hot water; check your home’s solar readiness with satellite mapping; and meet with local solar contractors. Peggy Dennis, President of the Montgomery County Civic Federation, attended the inaugural Solar Bethesda in 2010 and, as a homeowner with recently installed solar panels, is participating in a residential roundtable discussion at this year’s event. Sponsors and exhibitors include leading solar solution providers, as well as other energy and financing experts from the public and private sectors, including lead sponsors Standard Solar, Kenergy Solar, Mid-Atlantic Federal Credit Union, and Solar Energy World. Solar Bethesda takes place Saturday, June 25, 10 am – 4 pm at Bethesda Green, 4825 Cordell Avenue, Suite 200, above the Capital One Bank at the corner of Cordell and Woodmont in Bethesda. Attendance is free and we will have activities for the kids. Please RSVP at http://www.bethesdagreen.org. Here’s what’s going on in green this week. 2010 Bethesda Magazine Green Awards Call for Nominees — Bethesda Magazine is accepting nominations for its first Green Awards, which will recognize businesses, non-profits, communities and individuals that are leading the local fight to protect the environment. Deadline for submissions is July 1, 2010. Winners will be profiled in the November/December issue of Bethesda Magazine and recognized at the Bethesda Green gala on Oct. 7, 2010. The Green Awards are presented by Bethesda Magazine in partnership with Bethesda Green. DC Second on Green Roofs List, Baltimore Fourth – The industry group Green Roofs for Healthy Cities says Chicago led the country last year with more than 500,000 square feet, while Washington was second with about 190,000 square feet of green roofs. Baltimore was fourth with almost 100,000 square feet. Rockville’s New Green Building Codes Applauded – The rules may make the city a more attractive location for future development. County Moves Forward on Start-up Program for Farmers – Woodstock Equestrian Park is top choice for Montgomery County farm incubator program. Community Groups Seek to Grow Gardens at Schools – County residents try to get Superintendent Jerry Weast to reverse his stance. June 8 – Prince George’s Green Drinks – Join the Prince George’s Green Power Coalition–a loose group of businesspeople, local government officials, nonprofit professionals, “green-collar” workers, and union folks–for a Green Drinks evening of socializing and networking. 6:30-8:30 pm at the DuClaw Brewery in the Bowie Town Center (4000 Town Center Blvd. Bowie, MD 20716). June 9 – Smart Growth Speaker Series – Peter Harnik, Director of the Center for City Park Excellence at the Trust for Public Land, will discuss “Urban Green: Innovative Parks for Resurgent Cities.” Sponsored by the U.S. EPA, ICMA, the National Building Museum and the Smart Growth Network. Takes place at the National Building Museum, 12:30-1:30 p.m.
June 12 – Solar Bethesda, A Free Solar Expo – This event at Bethesda Green will feature local solar-panel installation companies, energy organizations, speakers and panel discussions about the ins and out of adding solar to your home, plus online satellite mapping to determine your home’s readiness. We’ll also have info about the various solar energy tax and purchasing incentives. RSVP now! Solar Bethesda will run from 10:00 a.m. to 4:00 p.m., June 12 at Bethesda Green, 4825 Cordell Ave., 2nd Floor, Bethesda, Md. It’s getting hot—and humid—here in the Washington, DC, area. Learn how you can put all that solar radiation to work for you—and how much more affordable it is now, thanks to federal, state and local incentives. Join Bethesda Green at our first annual Solar Bethesda Expo, Saturday, June 12 from 10:00 a.m. to 4:00 p.m. It will take place at the Bethesda Green offices, 4825 Cordell Ave., 2nd Floor, in Bethesda, Md. Solar Bethesda’s Gold Sponsors are Solar Energy World and the Maryland Clean Energy Center. We’ll have exhibits from 13 local solar and energy companies, including one station where you’ll be able to view your home using satellite mapping—to determine how suitable your site is for a solar power system. Representatives from the Montgomery County Department of Environmental Protection and the Maryland Clean Energy Center will be there, too. You can get info on costs, benefits, various types of solar equipment, tax credits and other incentives. We’ll have one discussion about solar purchasing cooperatives. There will also be a panel discussion featuring local residents who are living with solar systems. In 2009, their first calendar year with solar, Lisa and family paid a total of $591 for electricity. From January through April 2010 they paid $117. In comparison, during their last full year with only Pepco power, they paid $2,035–so they saved $1,444 on electricity that first year and this year they’ll probably save around $1,684. At that rate, the system will pay for itself in another two years. Plus they are generating their own electricity with no emissions! And that doesn’t even count the months, such as this past April, when the Heatons generated more electricity than they used, resulting in a $53 credit from Pepco! So it does pay to go solar! And solar hot water systems are even less expensive. 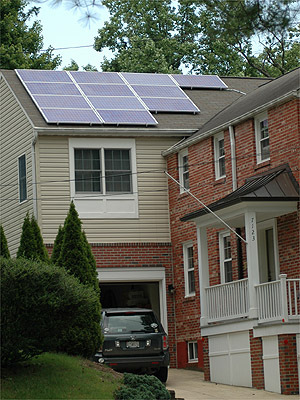 Come to Solar Bethesda, Saturday, June 12, and find out if solar is right for your home! When: Saturday, June 12 from 10 a.m. to 4 p.m.